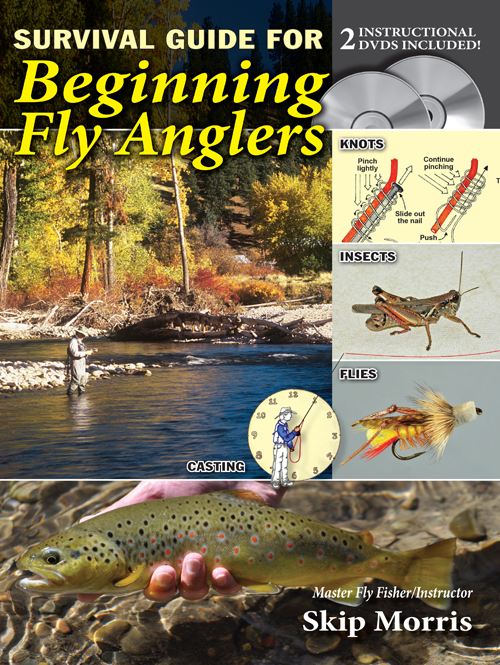 This book makes learning to fly fish easy—and fun! And it teaches this magnificent sport in new and highly effective ways. For starters, in the covers of the book are two DVDs to show in action what the book teaches, and to clear up any possible confusion. Color photographs and color illustrations abound. 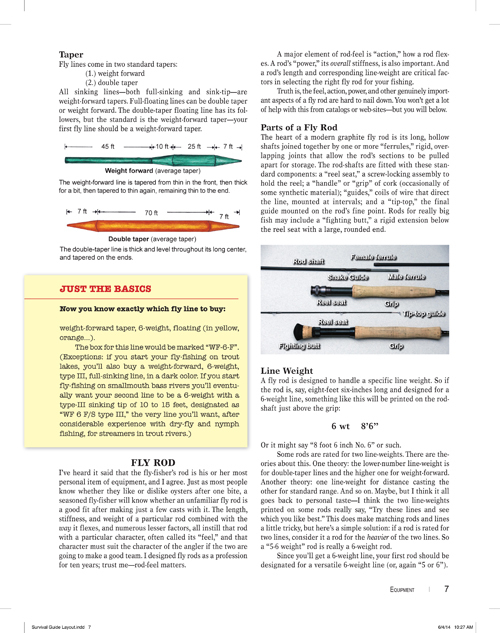 The instructions in Survival Guide for Beginning Fly Anglers are a snap to follow, and pared down to only what you need to know in order to start catching fish. In fact rather than offering heaps of information on all kinds of rare and exotic species and kinds of fly fishing, it limits itself to sound and appropriately thorough instruction on just four kinds of fly fishing you can find almost anywhere in North America; two of the types are found around the world. Learning something new always goes best when you’re not overwhelmed with mountains of advanced or largely impractical detail. Section Summaries: "Just the Basics"
Throughout the book are boxes titled “Just the Basics” that tie up everything from a whole section in a few carefully-chosen words, a sort of a short, plain list of the major points for reference that make everything easy to understand and quick to learn. You’ll explore fly-fishing equipment first. You’ll learn about fly rods and reels and tapered fly lines and all the things you need to gather in order to go out fly fishing. Skip also keeps these items to a minimum—you’ll have everything you need in order to catch fish, but no extra items to break your budget or just, again, overwhelm you. And Skip will help you select among the seemingly endless options in reels and rods and the rest. Then you’ll learn about flies and the creatures they imitate. 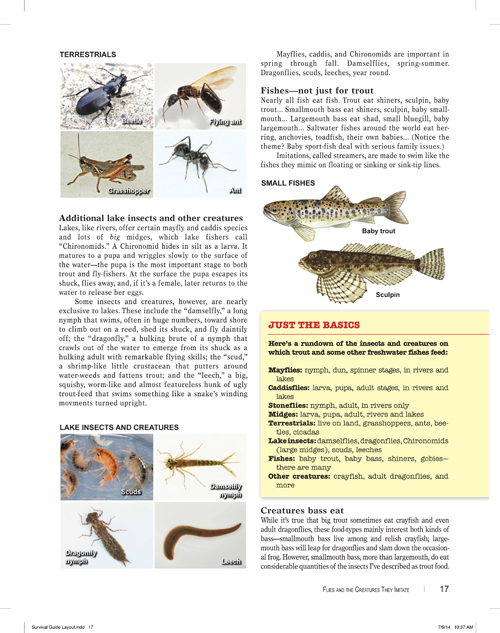 You’ll learn about dry flies and emerger-flies, streamers, hair bugs, and more. 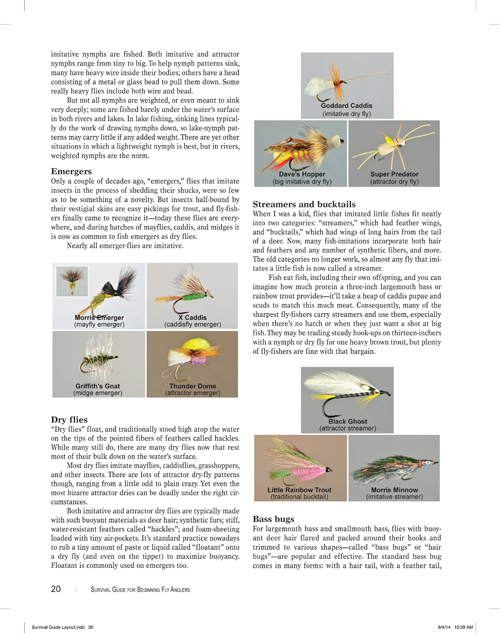 You’ll learn about mayflies and caddisflies and sculpin and other things gamefish eat that serve as models for flies—and throughout the rest of the chapter, there are lots of color photos to make everything clear. 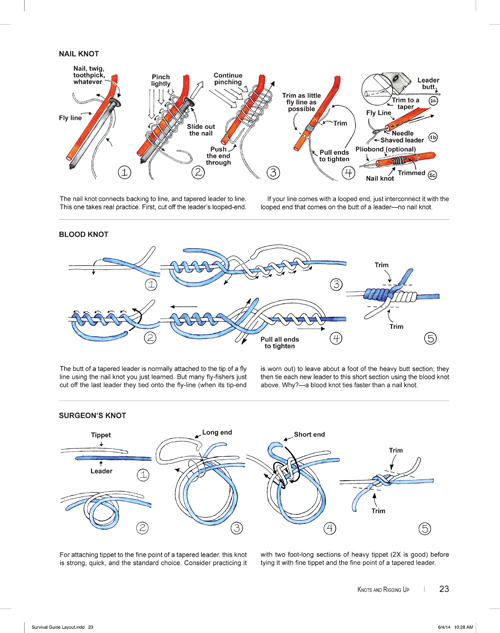 Next, knots, how to tie them and how, when, and where they’re used. Then fly casting. Both knots and casting are presented with clear instructions supported by clear illustrations and video demonstrations. 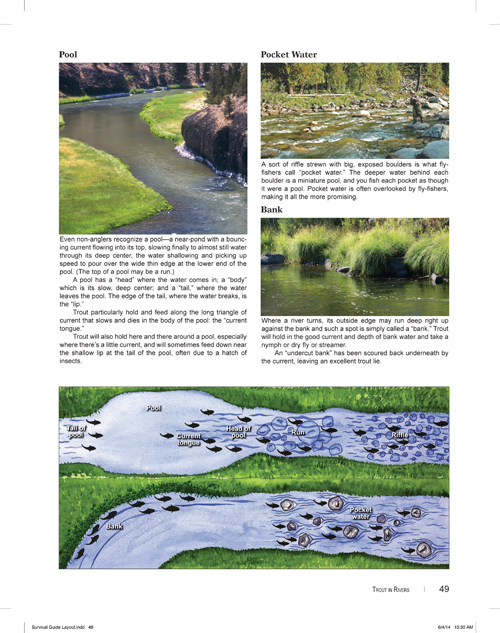 A couple of chapters tell you how to find fish in rivers and lakes and how to hook, play, and land fish, and more. Doesn’t it make sense to start out fly fishing with one of these wonderful nearby options rather than with African tiger fish? At the end of each of these four chapters on different kinds of fly fishing comes a narrative walking you through a typical day of such fishing—basically, you go out fishing for a day with Skip, get the feel of the fishing, see and experience it in your mind. A great way to prepare you for actually going out on your first fishing adventure. So if you’ve been afraid to try fly fishing, afraid it’s too complex or too expensive for you, fear no more—with the Survival Guide for Beginning Fly Anglers at your side you needn’t have a worry, just the fun and fascination of entering this magnificent sport.